This month is all about the 4 seasons – Spring, Summer, Fall, and Winter! 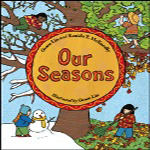 Talk about how you and your child feel during the different seasons. What are your child's favorite things to do each season? Help them learn the names of each one and what it looks like as the seasons change.